There’s never been so much to read and so many readers—and that’s part of a much larger problem for politics. In the groggy aftermath of the 2016 election, slightly more than half of Americans are still in shock. In an effort to understand not only how Trump happened but how they had so underestimated his appeal, editorialists have loudly pointed fingers at Facebook, which, according to a new Pew report, is now used daily by 68% of the American population. Facebook, they write, is uniquely responsible both for a seemingly unmitigated spread of fake news and for serving up news stories that fit users’ own beliefs, trapping us all in our own filter bubbles. Of course, the increasing polarization in America—the shrinking overlaps between conservatives and liberals and between rural and urban America—is larger than the Facebook news feed. But the criticism of the social network highlights a broader problem: not the problem of not enough information, but rather an overabundance of it. The Conservative Daily Post later removed the tweet, but the retweets, Facebook posts, and the story itself remain online. “There are lots of folks who are not prepared for this huge onslaught of information and figuring out how to deal with that,” says Craig Silverman, who reports on fake news for Buzzfeed and revealed teenagers in the Balkans were running fake news sites in support of Donald Trump to make money. In the last fifteen years blogging has changed the way news is written, reported, and distributed. No longer do writers and pundits require a printing press or much financial wherewithal—they simply need a computer and an internet connection. While this diversification has brought about a smorgasbord of new points of view and methods of reporting, it has also opened the floodgates to a spectrum of unvetted information providers. As journalism has expanded online, pontificators and gossips have proliferated. And as eyeballs have moved online too, local news organizations—especially those in rural, small and medium-sized localities—have suffered precipitous drops in advertising, meaning layoffs, severely cut resources, and outright shutdowns. At the same time, point-of-view journalism, wherein reporters intimate or disclose their subjective opinions or their stance on particular issues, began taking hold. The rejection of the view-from-nowhere style of reporting, an attempt to appear unbiased in factual presentations, may have helped to foster an environment in which readers mistrust reporters who have a personal view on a given topic. Meanwhile, online and elsewhere, news blends together with entertainment—a response perhaps to failing revenue and a constant need for pageviews. On a variety of websites geared toward younger, largely progressive audiences, content—a word that now slyly encompasses reported story, advertising plugs, opinion and just about anything that resides on the web—shares much of the same tone. Blogs have blossomed into full blown media companies and brought with them a sarcastic, edgy voice that can undermine their credibility. Fake or poorly reported news has adopted a tone of authority. The result is a jostling media landscape where the conspiracy theorists become indistinguishable from the credible sources. “The whole flow of the information is a lot more conversational and a lot more decentralized,” says Rich Edmonds, media analyst at the Poynter Institute. Even if internet-based reporting has left its mark on other forms of media, it’s not the only game in town: TV still rules. “When you take a step back, you have to recall that television is such a huge staple in the typical American media diet,” says Jesse Holcomb at Pew Research. While 65% of those polled earlier this year turned to the web for their news on the election, 78% of people watched television to get the latest on Trump and Clinton. Overall, 57% of people frequently flick on the tube to find out what’s going on in the world. 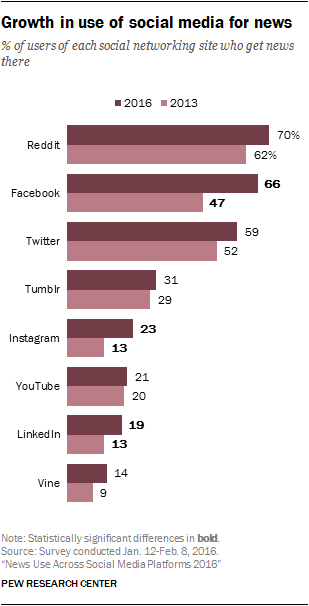 That’s compared with the 38% of Americans who regularly get news from social media. But social media’s role in the news cycle is undeniably outsized, and as a source of news, it’s growing quickly: according to the recent Pew report, daily Facebook use among U.S. adults rose from 70 to 76 percent in the past year. And, says Pew, the influence of those posts are growing too: 20 percent of survey respondents said social media has altered their position on a political issue and 17 percent say it has changed their view of a specific candidate, with Democrats more likely to report a change in views than Republicans. Of course, the news a person ends up receiving depends greatly on where they go looking for it. Newspapers used to be the gatekeepers of information, separating out the nonsense from the stuff of import. But they no longer occupy the grand role they once did. Meanwhile, readers have turned to the places where they increasingly get the rest of their information, often for free: from the web and their phones. Online platforms, seeking ever more engagement and higher ad revenues, are more than happy to oblige. Earlier this year, Facebook launched Instant Articles in order to directly host publisher content and better serve it to users, and Google’s AMP service now offers publishers a similar feature in its search results. “We’re seeing a whole ratcheting up of how much consumption of news has moved to Google, Facebook, etc,” says Edmonds. On the whole, 14% of people found social media to be the most helpful source for catching up on the election, according to Pew. Roughly the same percentage of people thought news websites were the most helpful resources for understanding the election cycle. There is also a lot of overlap when it comes to where people are sourcing their news: Pew reports that nearly half of all Americans have more than five sources they turn to for election coverage. The rise of social media platforms as curators and distributors of news content has raised new questions about what civic responsibility they have and whether these gatekeepers should be filtering out factually inaccurate articles or reducing the “echo chamber” effect. The answers don’t seem immediately apparent. In the Washington Post, fake news blogger Paul Horner admits to not only making up stories that spread virulently online, but to creating fake source material for other stories. Much of it, he said, was quickly picked up by supporters of the president-elect. “I think Trump is in the White House because of me. His followers don’t fact-check anything—they’ll post everything, believe anything. His campaign manager posted my story about a protester getting paid $3,500 as fact. Like, I made that up. I posted a fake ad on Craigslist,” he told the Post. But as others have pointed out, the number of misleading stories on Facebook is less important than how far that content spreads, and how many people are affected by it. Facebook’s own research has demonstrated how effective it is at, for instance, encouraging people to vote or influencing users’ emotions. A Buzzfeed report this week details how the 20 top fake news stories on Facebook received more engagement than the top 20 mainstream news stories—part of a trend that seems to have begun after Facebook tweaked its algorithms to prioritize posts from friends. On Twitter, meanwhile, researchers at USC who examined a sampling of election tweets found that 1 in 5 were sent by a bot. Furthermore, social networks make it easy to insulate ourselves from people and information that don’t align with what we believe in. And even when we choose not to block out conflicting opinions and people from our feeds, algorithms can do it for us, turning our social feeds into a monotone hum of if-you-like-this-you’ll-like-that news and commentary. People with certain political leanings are learning to consult one set of sources and distrust others. While those who consistently identify as liberal tend to trust popular media, those who consider themselves conservative tend to trust very few news sources, according to a 2014 Pew analysis. The alignments are fairly unsurprising: conservatives trust Fox News, Breitbart, and Rush Limbaugh. Liberals trust a spectrum of news sources including the New York Times, Washington Post, NPR, BBC, CNN. 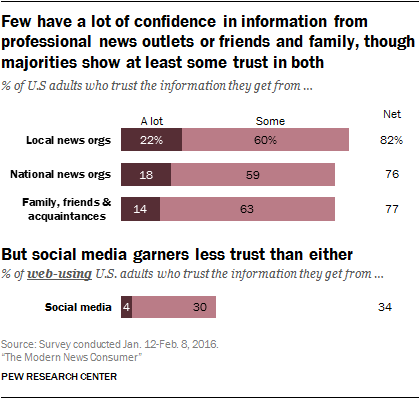 News on social media sites is the least trusted source. “Only 4% of web-using adults have a lot of trust in the information they find on social media. And that rises to only 7% among those who get news on these sites,” reports Pew. In his campaign, Trump leveraged uncertainty about the mainstream news, constantly working in his “lying media” mantra into stump speeches. “I don’t think hammering the media was the cornerstone of Trump’s whole campaign and appeal, but it fit right in,” says Edmonds. “[He] encouraged his backers to think … the media is part of the establishment that they want a break with.” As a result, even legitimate media critiques of Trump may have only helped to steel the beliefs of Trump supporters and feed the narrative that the media was out of touch. For those who would ordinarily fall in the middle, there is more information than ever from which to draw an opinion. The Internet has expanded geographic clusters to people with similar ideas across the globe. It also grants more access to opposing news and views that can be scary. 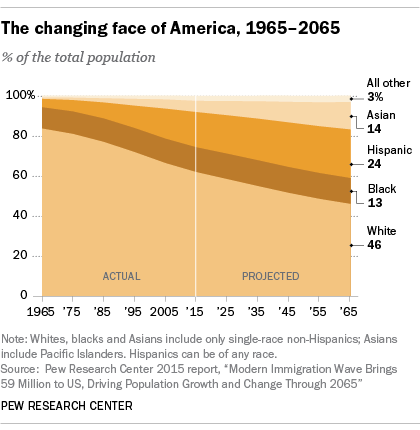 One of the most resounding refrains from Trump supporters (elegantly highlighted in a recent episode of This American Life) is that change (whether the move to clean energy or the immigration of refugees to the United States) is happening too fast. That may in part be a response not only to the change that’s happening in their communities, but also progressions they perceive from news and ideas captured in their various social feeds. In an era of when we can be so choosy about the news we get, occasional access to both far right and far left viewpoints may be scaring moderates, causing them to retreat into even more extreme silos. As a long term strategy toward cleaning up a polluted lake of information, Silverman suggests that schools should be teaching students how to be more media savvy and give them tools to pick out misinformation from verified reportage. In the future, we’ll all need to be our own editors, sussing out the real from the fake. In the near term, he suggests that web platforms embrace human curation in addition to algorithms. The more obvious hoax news is fairly easy to identify and could be tagged as such on Facebook and Twitter. He also thinks Facebook’s algorithm could be tweaked to lessen the impact of fake news. For instance, if a story is being shared amongst a small pocket of ideologically similar users, perhaps the network could refrain from blasting it out to a wider audience. In the days since we spoke, Google and Facebook have publicly announced initial steps to quelch fake news sites. Both companies have issued a ban on fake news from using its ad-platform—a move that could help defund these kinds of sites. Teams of humans will now vet the publications that seek ad promotion on two very important gatekeepers. But this is only the beginning of a much larger effort to keep less than quality information from reaching the most possible eyes. And there is a possibility that the news outlook won’t get any clearer. Trump has appointed Steve Bannon, executive chairman of fake news site Breitbart known for its bigoted and sometimes false news and opinion stories, to be his chief strategist. There’s worry that Bannon’s media background might help the Trump administration coordinate a well-run propaganda machine. It’s a concern that should make efforts to combat misinformation that much more urgent.